A new economic discipline seems to have emerged over the past several months: econometeorology, the explanation of the economy through weather patterns. Each month, jobs numbers are adjusted to account for seasonal variations. For example, there is typically a spurt of temporary hiring during the holiday season in retail, and there is typically a slowdown in construction over the winter months as snow and inclement weather prevent work. The seasonally adjusted number that we see every month helps smooth out those variations to make an apples-to-apples comparison of how the economy is doing. The effects of these seasonal adjustments can be seen in the chart below. In the context of this seasonality, economists have been looking at this year’s warm winter. 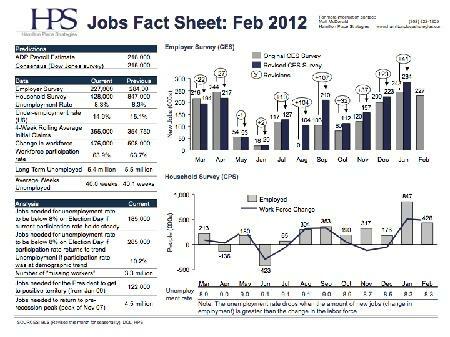 ﾠGoldman Sachs has estimated that the warm weather added between 50,000 and 70,000 jobs to the January number.ﾠ If this proves to be the case, we would expect to see an overestimation of jobs growth in the winter, with a return to the “normal” slightly lower trend as spring takes hold. But while econometeorology has been an interesting sidebar to jobs growth of the past several months, what we are really seeing is economists seeking to explain a significant one percentage point drop in the unemployment rate with more modest actual GDP growth; what Fed Chair Ben Bernanke called a “far from normal” job market. As we have noted previously, much of the speculation for these abnormalities has focused on the shifts in participation rate.ﾠ Barclays has projected that the participation rate decline is largely due to ongoing demographic shifts.ﾠ Morgan Stanley has said that the participation rate decline is due in part to significant increases in disability claims.ﾠ Goldman Sachs has pointed to short-term behavioral changes that they expect to reverse, holding participation steady for the year. The New York Fed has been looking at this issue and others in a series of analyses. If we think that the participation rate will hold steady for the remainder of the year, the President needs 184,000 jobs per month to get below 8 percent unemployment by Election Day. However, last month, we actually saw participation start to come back up.ﾠ If that returns to demographic trend over the coming two years, the President would need a much more aggressive 284,000 jobs per month. With eight employment reports left until Election Day, there is still time for job growth to strengthen more or fall back yet again.